On Monday, THQ Inc. announced they have reached an agreement to transfer their exclusive license with Zuffa, LLC to publish video games based on the Ultimate Fighting Championship to Electronic Arts Inc., effective immediately, in exchange for an undisclosed cash payment. THQ released three editions of “UFC Undisputed” for the XBox 360 and PlayStation3 consoles during their watch. The latest installment hit shelves this past February, and while it featured several improvements from its two predecessors, button-mashers weren’t rushing to their stores to buy it. With disappointing sales, THQ decided to cut their losses and bow out of the mixed martial arts arena. THQ’s loss is now EA Sports’ gain. “We’re incredibly pleased to announce today the start of a multi-year, multi-game partnership between EA Sports and the UFC,” Head of EA Sports Andrew Wilson stated at E3 in Los Angeles, California. 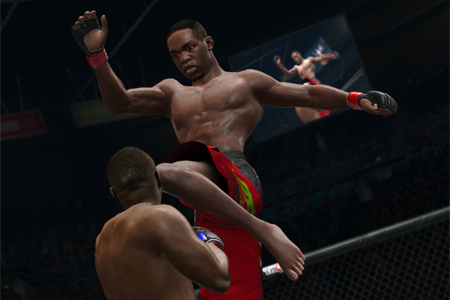 EA Sports released “EA Sports MMA” in October of 2010 to mixed reviews. The game was mostly comprised of Strikeforce fighters. No word on when the gaming giant will launch the UFC series.